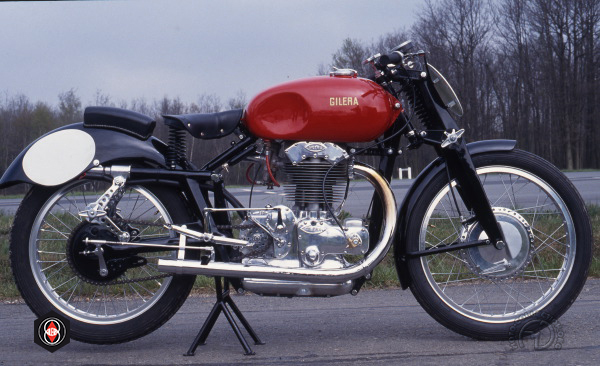 Few motorcycles have had a career as long, glorious and diverse as the Gilera Saturno. Between 1940 and 1957, this single-cylinder machine revealed itself as one of the finest motorcycles of its day in sport, racing, speed, endurance and motocross events. The Saturno Competizione, launched in 1940, became known as the Sanremo after its extraordinary victory in the 1947 Circuit of Liguria. It underlined its right to the title with five successive wins in this race, from 1947 to 1951, with Bandirola winning twice, then single victories by Masetti, Colnago and Valdinoci. Much lightened, the Sanremo only weighed 287 lb against 351 lb for the Competizione. The surplus weight was eliminated from the cycle part (of which the frame, like the 1946 Rondine four, replaced tubes by pressed-steel components and used a diamond-section for the single downtube), the girder .fork and the rear swing arm. The Sanremo also inherited the Rondine's front brake with full-width drum, had a rear mudguard that doubled as a racing number plate and a new fuel tank with recesses for the rider's knees. Though not as fast flat-out as its rivals such as the Guzzi Dondolino and Gambalunga or the Manx Norton, the Sanremo compensated with a combination of virtues - its astounding pickup from low speeds, its unmatched handling and its remarkable ease of riding. Stroked out to 582cc (84x105mm), the Sanremo could be coupled to a sidecar - an outfit, with a top speed of 93 mph, lapped Monza at 75 mph. The very rare Saturno "Sanremo."